I must confess to always being a lover of softies. As a child I much preferred a softie to a doll. Adelaide, on the other hand, is a doll lover. We have barbies galore, much to my horror. Thankfully, we also have Maggie Rabbit and Juniper Kitty, thanks to Alicia Paulson. Call me old fashioned, but this is much more my speed than a Barbie in a cheap, short dress. These little friends sit on the spare bed in Adelaide's room. Since I took these photos Adelaide has found the pink ink pad used for the blush of pink on their cheeks and decided to apply a little more rouge to Maggie Rabbit. You can imagine how she looks now! I also have the kit for Basil Fox. He's currently in the making. All demure young ladies need a dapper chaperone to accompany them after all. Basil Fox is just the ticket I think. To celebrate the launch of my patterns I wanted to create a free pattern so sewists can see how my patterns work and are laid out. 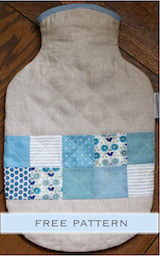 So I've created a simple pattern for an item I use a lot - a Hot Water Bottle Cover. In fact I'm sitting with one on my lap now, as the snow falls outside my window (we are skiing for the school holidays). 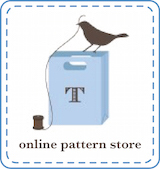 You can download the pattern from the left sidebar of my blog. This is an item I've made a number of times. I feel the cold so I always like to have a hot water bottle handy. This is a simple item to sew and satisfying when you want to tackle a small project that can be completed quickly. It's something I like to make when I don't have the energy for a whole quilt but want to play with mixing and matching fabrics. It's also a way to put an orphan quilt block to good use. If you do happen to make a Hot Water Bottle Cover from this pattern, please post a photo in the Flickr Townmouse Patterns Group. To my blog readers I'd also like to offer you a coupon code. You can get 15% off any pattern purchases in my Etsy store before Sunday 12th July when you enter the code BLOG15 at checkout. And stay tuned for a blog tour of my patterns. Remember yesterday I mentioned the group of lovely, supportive fellow bloggers and pattern designers? Well, they are going to share with you their version of a Townmouse garment in the next few weeks. Hopefully these will grace our Christmas table tomorrow morning. I have two more to do. It's hard to tell in these night-time photos, but these napkins are a soft grey, sage green linen. I picked them up at Williams Sonoma earlier this year. I have done the cross stitch in the same colour - just one shade darker. The alphabet pattern is from this book, purchased a few years ago. There is one for each member of the family. I just have the "K" and the "T" to go. Max and Tom are at a midnight Christmas Eve church service with Will's mother, the presents are under the tree, Father Christmas has already been to our house and the rest of the family is asleep. It's time for me to put the kettle on and get stitching. Merry Christmas everyone! Yesterday I felt like taking on a small craft project. Life is really hectic at the moment, with the weeks being swallowed up with weekends at the snow and weekdays poring over architect's plans and joinery drawings. All very exciting stuff but there's not a moment to spare. This quilted pincushion was squeezed in between homework supervision and dinner preparation last night. I like having a few pincushions so one can travel with each project. It saves me from stabbing the furniture with needles and pins. I've resurrected an earlier hand quilting project from a few years ago. I have now completed 5 blocks. I'm not sure how many more I will need to make. It might be a 9 block quilt or a 12 block quilt. This little box of craft travels with me to the snow each weekend. At least there I find more time for sewing. It's funny how it's so much easier to relax when I'm away from home. Do you find that? As in previous years, the children and I got into the Halloween spirit. I carved some pumpkins, put some orange balloons on our fence and got our bowl of treats ready on the hall table. Halloween is big in our neck of the woods, because our streets are full of young families. And the children in those families aren't going to pass up the opportunity to amass a large quantity of free sweets. I borrowed some inspiration from Pinterest. As you can see, this costume idea is by no means my original design. But I happened to have a pretty selection of owl coloured fabrics and I couldn't resist replicating it. I made a little feather template that was 4 inches wide and 5 inches long. I grabbed a handy Townmouse tee, set my machine to zigzag and got to work. This little outfit took about 30 minutes to construct. The owl eyes were cut out of my very handy patternmaking card and stuck to an old pair of sunglasses. Teamed with some grey leggings, Adelaide was good to go. Now I think it's time for a bowl of pumpkin soup! The year just passed was a very busy one in our family. There was less time for crafting than I'm used to. There was more dressmaking than quilting. Adelaide has been the main beneficiary of my sewing endeavours. Here's to a productive 2012 for us all. Henri was going round the house with his clipboard this morning, asking his siblings what they wanted for Christmas. (He must have raided Tom's stationery supplies for next year to find said clipboard.) Adelaide's response was "doll's clothes". This sweet little doll is so lovely to cuddle because of her soft body. The problem is she needs high necks and sleeves to cover her undergarments. I drafted a pattern block for Amelie (dolly's name) - a simple bodice block with sleeve. I used a few scraps to replicate my most favourite of all Townmouse dresses. This one fits the bill with its high neck and elbow length sleeves. 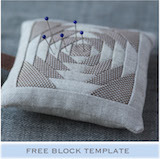 Now I know that the pattern block is a good fit I can create a few more variations for Amelie. I have a sweet little suitcase, purchased from Lark, that I can put Amelie's wardrobe into. A quick trip to the local button shop is on my To Do list today to buy some simple press studs so Adelaide can easily dress and undress her doll. I'll let you know how I go with the rest of Amelie's wardrobe. There might have to be a few matching dresses for Adelaide in the mix.